Fact: Physical exercise is stress! Specifically, exercise is the manifestation of the stress response. Metabolically speaking, aerobic exercise is the flight response, whereas anaerobic exercise is similar to the fight response. Just as the heart races during a crisis and blood pressure increases dramatically with personal chaos, the same physical response occurs during jogging, walking, swimming and most other modes of exercise. The good news is that once the exercise session has ended, the body’s response is to return to homeostasis (also called the parasympathetic response or parasympathetic rebound). Conversely, when people are chronically stressed, the body rarely returns to a resting state which then sets the stage for disease and illness. To use an apt metaphor, exercise is like a homeopathic remedy, where “like cures like.” Here is one more vote for starting or maintaining a regular exercise program: Physical exercise flushes out the stress hormones (e.g., cortisol, aldosterone, thyroxine, vasopressin, etc.) rather than having this toxic stress cocktail linger in your body for days on end wreaking havoc on your body. By now you know the routine: Intensity (75% of max heart rate), frequency (#’s of times per week—the magic # is 3) and duration (# of minutes per exercise session—the magic number is 30). This famous recipe for fitness is ideal, but if your life seems too complicated, I have this suggestion: Just get out side and move! 15 minutes out and 15 minutes back. Walking is highly underrated and it’s a great mode of exercise to flush out the stress hormones. Morning and evening walks are ideal! There is enough research on the merits of cardiovascular exercise to build a road to the moon! The fitness boom of the ‘70s has come and gone, but the importance of exercise had only increased. Physical exercise isn’t the fountain of youth, but it’s the next best thing! For many people physical exercise may seem like a luxury (certainly the time to exercise may seem like it), but more than ever it’s a necessity. Exercise is considered “good stress.” If you don’t have a formal exercise program, now is the time to start. Start slow but steady! If you think you don’t have time, you need it even more. 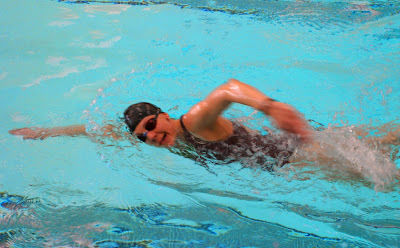 Many thanks to Kristin Weiner, a friend and colleague, who obliged my request one day at the pool, while doing our respective workouts, to take a few photos of her great swimming style. Thanks Kristin!